Festival in Thrissur, Kerala. Photo by Spisharam. Who doesn’t love elephants? If you love them as much as I do and would like to see some on your trip to Kerala, here are the best places to find them. If you’d like to spot elephants in Kerala in the wild you’ll need to visit one of the national parks. Of course, sightings aren’t guaranteed, but if you do get lucky it’ll be an exciting experience. The most popular wildlife sanctuary in Kerala has a good population of elephants. A boat trip is a popular way to explore but you’ll have a better chance of seeing elephants if you go for a guided trek into the forest. The longer the trek, the better your chances. Read my Guide to Periyar Wildlife Sanctuary for full details. The Wayanad region in Northern Kerala is much less visited than Periyar and has two wildlife sanctuaries with good chances of spotting elephants. Read my post on Quiet Alternatives to Periyar Wildlife Sanctuary for full details. Chinnar is easily reached from Munnar, but also receives far less visitors than Periyar. The watch tower is a great place to look out for elephants and you can even sleep out overnight. Chinnar is another one of my Quiet Alternatives to Periyar Wildlife Sanctuary, so have a read for more information. If you don’t fancy venturing into one of the parks, or if you didn’t have any luck finding the gentle beasts, don’t despair! There are some great options for guaranteed close up interaction with elephants. Kodanad is an elephant rescue and training centre that is a popular daytrip from Cochin. It’s located 50km away so you’ll need to arrange a trip through your hotel or tourist office, or hire a taxi. If you arrive by 8am you’ll have the opportunity to help wash the elephants, and you can also have an elephant ride. If you are hiring a car to take you from Cochin to Munnar this is a good place to stop on the way. Guruvayur is an interesting off the beaten track place to visit in Kerala. It’s a bustling pilgrim town 25km from Thrissur that is well known for its temple, one of the richest and most important in the state. Although non-Hindus aren’t allowed inside the temple you can still enjoy the activities that take place outside during one of the many festivals held there. The largest festival is Ulsavam during February or March. There are a variety of music and dance performances, as well as an elephant race and procession. Even if you don’t visit during a festival you can still see elephants at the Punnathur Kotta Elephant Sanctuary 3kms away. Elephants are trained there for temple activities, and visitors are always welcome. 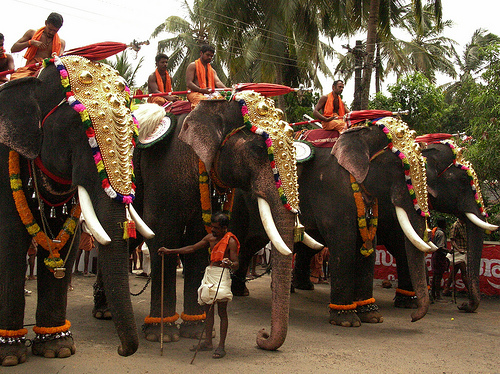 Highly decorated elephants are an essential part of temple festivals in Kerala. Thrissur is another less obvious place to visit in Kerala that has plenty of temples and festivals, so it’s a great place to spot elephants. The annual Puram Festival, the biggest festival in all of Kerala, takes place here in May and features elephant processions, drum orchestras and lots of traditional arts. You can get here by bus or train from Cochin in a few hours. Festivals take place in Kerala temples throughout the year so keep your eyes open, ask around and you’re bound to come across some elephants. This entry was posted on Sunday, March 21st, 2010 at 4:00 pm	and is filed under Kerala India Travel, Kerala Suggested Itineraries, Periyar Wildlife Sanctuary. You can follow any responses to this entry through the RSS 2.0 feed. Both comments and pings are currently closed. Though Nehru Boat Race at alleppey is the most famous and most grand, there are several other races in different parts of Kerala. It can get crazy but worth all the trouble. I love elephants too much and it is in Kerala that very nice. your given listing of elephant sanctuary are much appreciable. nice post to see elephants in Kerala.